That's such a lovely picture, I also wish I knew who did it! I like what you did with the wallpaper, its nice and simple but effective. Good job! I love the scene! I love the effects! I love it! It's Gorgeous! I love they way they are drawn! This is sooo pretty, the colours and how they look at each other. I know who drew the picture. I have the url and everything. She does an amazing drawing of them. Most look remarkly close to Takahashi's work. wow, really beautiful! thanks for your hard work! 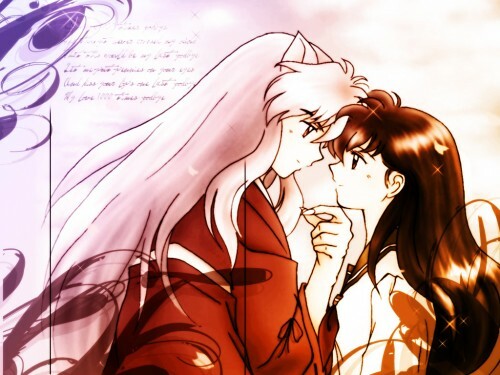 What a sweet moment between thses two characters! I love it my favorite char.s fall in love! I love inuyasha and also this picture ? ohh god!that is so romantic between them.i love this picture so much!thank for sharing it!thanks alot!